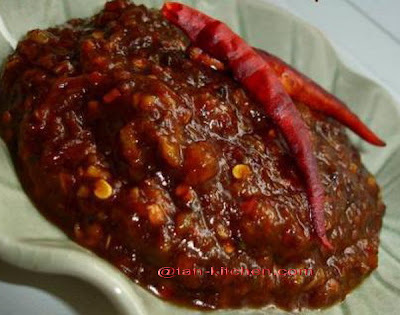 Here are Roasted Chili Paste or Nam Prik Pow are very important ingredients for many Thai dishes. Always use for cooking STIR-FRY and SOUP menu. It’s a popular thai cuisine. Thai Chili Paste (nam prik pow) is often added to Tom Yum Soup. It is also great with steamed jasmine rice or as a dip for raw or steamed vegetables, pork crackling or crispy rice. Pound roasted chilies with salt to a fine paste. Add shrimp paste, pound lightly to combine. Transfer the mixture to a pan, saute in oil until fragrant. Season and taste with fish sauce, sugar and tamarind juice, stirring well.